In New York City as in other parts of NY State and across the country, garbage collection is much needed to maintain a clean and healthy community but can also endanger the safety of garbage truck drivers and the public. Sanitation workers face dangers inherent in their jobs. In fact, sanitation workers and other jobs in waste management face the threat of injury or even death on a daily basis and are statistically ranked in the ten most dangerous jobs in the United States. The Bureau of Labor Statistics issued a report which listed garbage truck workers as the seventh most dangerous occupation in the country. The rate of deaths due to accidents on the job was nearly 30 fatalities for every 100,000 sanitation workers. In New York City, the Department of Sanitation (“DSNY”) is responsible for garbage collection. DSNY has over 5,000 vehicles in service nearly 2,000 large trucks including garbage collection trucks, dual-bin collection vehicles, and street sweepers. The DSNY is the largest sanitation department in the world. Workers collect and handle over twelve thousand tons of trash each and every day. A typical garbage truck weights between 20-30 tons or more. The volume of work coupled with the massive size of these vehicles can lead to serious injuries or death. 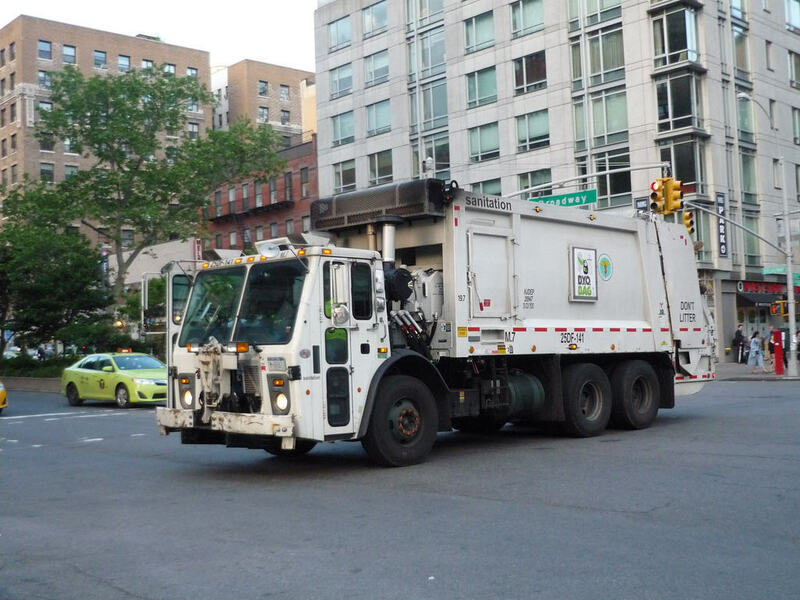 In one recent year, sanitation trucks in the City of New York were involved in more than one thousand accidents with the Comptroller’s Office paying out nearly $40 million in settlements and verdicts. Cuts, Lacerations, and Crush Injuries: This is the most frequent injury sustained by sanitation workers. Lacerations or cuts can occur due to falls from a garbage truck, moving equipment and parts on a sanitation truck, as well as falling objects. Crush injuries can occur when a part of a garbage truck malfunctions or is used incorrectly. For example, a rear loader sanitation truck dumpster can dislodge, fall, or crush a worker’s hand. Negligent use of hoist controls may contribute to this type of accident. OSHA has published a safety bulletin about rear loading trash truck accidents. Case Examples: Our firm handled an injury case of an NYC sanitation worker that was caused to slip and fall from a garbage truck while collecting trash. The City of New York sanitation employee was stepping off the edge of the truck when he was caused to slip due to an icy condition landing on his back. He later needed a lumbar laminectomy spinal surgery. The case proceeded to trial in Supreme Court Kings County (Brooklyn, NY) where a jury rendered a verdict of $1,200,000.00. Struck by a Garbage Truck: Another type of accident is when a sanitation worker, bicyclist, or pedestrian is struck by a garbage truck. This often happens as the trash truck is backing up without first ensuring it is safe to do so or when a garbage truck driver’s rear view or side mirrors are obstructed. Additionally, if a garbage truck is parked or stopped in an unsafe area, sanitation workers can be struck by other vehicles especially in high traffic areas where a worker may suddenly dart out at the side of a truck near moving traffic. Emergency road conditions such as snow, ice, or other bad weather are especially dangerous for garbage truck drivers because trash trucks maneuver poorly, are harder to slow down or stop, and are difficult to handle in bad weather. Garbage Trucks should have side guards installed. This dramatically reduces the chances of pedestrians or cyclists being caught in the space between the road and side of a sanitation truck. A comprehensive report on this issue was recommended to the City of New York. While some private garbage trucks do have rear back -up cameras, many trucks still do not have this technology. This can lead to serious accidents especially in busy and high traffic areas such as Manhattan. In residential areas, kids ride bikes and play on sidewalks and curbs where garbage trucks often stop and reverse. This enhances the danger. Cost of future medical care and other related expenses (such as the cost of a surgery which can be very high) – (economists and doctors). An injured person only has ninety (90) days to file a notice of claim if the case is against the City of New York or a city agency such as the Department of Sanitation (“DSNY”). A lawsuit must then be filed within one year and 90 days from the date of incident. It is very important to hire a garbage truck accident lawyer promptly so that these strict deadlines can be met. In the case of a private garbage truck, the time limit is three (3) years from the date of incident. Call the police at the scene of accident and make sure they file a police accident report. If the police do not come to the scene, file an MV-104 report with the Department of Motor Vehicles if you are a driver of a vehicle involved in the accident. How Can an NYC Garbage Truck Accident Lawyer Help Me? keep in constant contact with you as our client via phone, face to face meetings, text messaging, email, or other preferred methods of communication. After an accident, contact the NYC garbage truck accident attorneys at Frekhtman & Associates for a free consultation. We will help evaluate and investigate your case. There is never any upfront fee. In fact, we litigate the case and pay expenses upfront so there is never any cost to our clients. The legal fee is a percentage of the money we win for you.